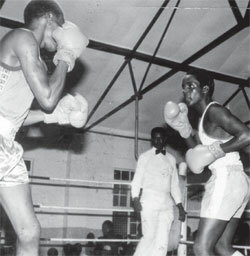 Kenya sent three boxers to the 1982 World boxing championships. The three boxers and recorded four wins though none of the boxers reached the medal bracket. But this tournament helped sharpen them. Worth noting is that Ibrahim Bilali was only 17 at the time. Two years later he won a bronze medal at the 1984 Olympics. Hussein “Juba” Khalili went on to win a gold medal at the 1982 Commonwealth games. Hussein Khalili and his brother Hassan Khalili were prominent boxers in the Kenya boxing scene in the early 1980s. Hussein represented Kenya Breweries Boxing Club and Hassan boxed for Posta boxing club. As of 2015, the Khalili brothers are based in Kampala and are still busy promoting grassroots boxing all over East Africa. Juan Molina whom Bilali beat in round 2 went on to become world super-featherweight IBF champion. Pernell Whitaker who beat Khalili, went on to become world welterweight champion and was one of the most famous boxers in the world during the 1990s. Bilali for his part, inexplicably disappeared from the boxing scene after he won the bronze medal in Los Angeles in 1984. He was only 19 at the time and appeared to have a very promising future. This entry was posted in kenya boxing results, Kenya Sports news and commentary and tagged hussein khalili, Ibrahim "Surf" Bilali, kenya boxers, Peter Wanyoike. Bookmark the permalink.